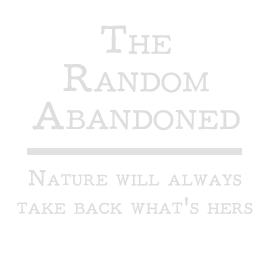 So what is The Random Abandoned? Throughout the years, I have been fascinated with anything abandoned. It all started when I first found out about Titanic. From there, my love of shipwrecks grew. After that, it pretty much spiraled out of control. Abandoned cars, buildings, towns, and so on. If it was once made by human hands, but left to be taken back by the hands of nature, I fell in love with it. I was always interested in history. Local history was always my favorite: the little untold stories that you can only discover by talking to the old people in town. Finding out why a house was left to rot, why that glass bottle isn’t made anymore, why the car was left in the driveway for thirty years, and so on. I would frequently enter small building left to be reclaimed by the elements, and I would sift through what was left behind. I would try to determine why it was left to rot. When the internet became even more expansive, it became easier to track down the history of what I saw in front of me. I enjoy finding out stories, and then telling them. From abandoned air ports, to military buildings, and more, if it hasn’t been in use for some time, I want to see it. What nature has the power to do is incredible. Man can build the most “impervious” structure, but if unattended, nature will always take back what’s hers. Metal will rust, concrete will crumble, wood will root, and glass will shatter. What I want to do is share this beauty with you, and tell the stories of the past before they are gone forever. Join me here, on The Random Abandoned.